Life in a House of Testosterone is thrilled to welcome you to another amazing gift guide and giveaway event sponsored by the Social Media Gurus Network! 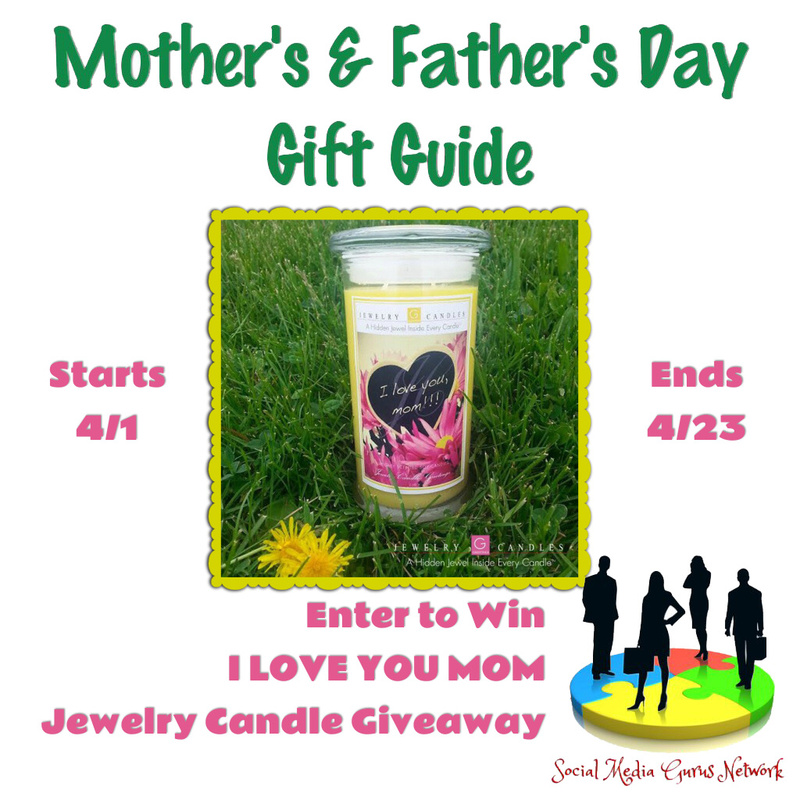 We are kicking off our Mother’s and Father’s Day Gift Guide and Giveaway event with this amazing giveaway from Jewelry Candles! Mom will love this gorgeous candle on Mother’s day or on her birthday! Our new I LOVE YOU MOM Jewelry Greeting Candle will surely be a great addition for moms everywhere! Whoever you give this precious candle to is sure to love it as well as the buried jewel that lies within it in this Jewelry Greeting Candle! Be sure to select the scent that you want to go with this theme with the selection scent button above and you’ll get this lovely greeting cards jewelry candle with the scent of your choice! 3 gifts in one! A jewel, a candle and a greeting card! yay! Welcome to the I Love You Mom! Jewelry Greeting Candle Giveaway! A Jewelry Greeting Candle valued at $24.95. Mom gets her choice of scent, jewelry (bracelet, earrings, necklace or pendant, ring) or you can choose the Surprise Me Option and we’ll pick an item for her! This giveaway is in no way endorsed, affiliated, or associated with Facebook, Twitter or any other Social Media Networking Site.You are not eligible if you have won a prize from the sponsor in the last 12 month. This Giveaway is valid in the United States Only and Entrants must be 18+ years of age to enter. This giveaway event will end at 11:59 PM (EST) 4/23/2017. The winners will have 48 hours to email their information back to lifeinahouse@outlook.com or a new winner will be drawn, you may want to put this email address as safe as it could go to spam. The sponsors are each responsible for shipping of the above prizes. No blog associated with this contests are responsible for prize fulfillment. If you would like to be a sponsor in a giveaway like this please email Kimberly Miller at lifeinahouse@outlook.com. Previous post: PeachSkin Sheets Giveaway!